She only had a little lamb follow her to school. Kerry had a little horse, and he was way more fun that a bag of wool. 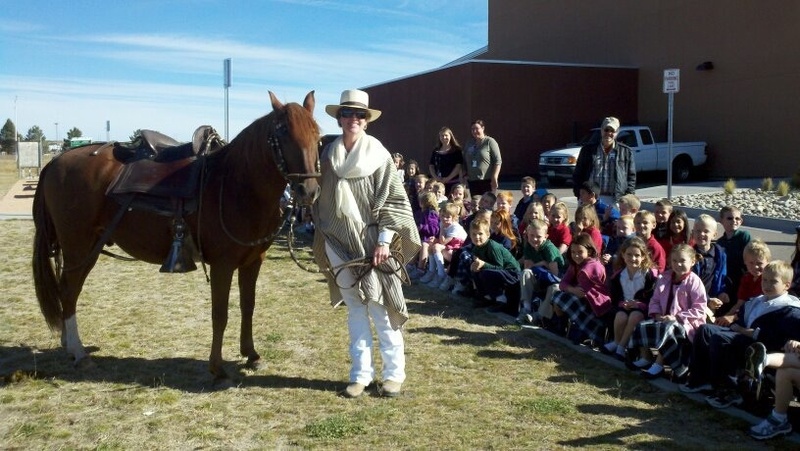 My daughter’s first-grade class has been studying Peru, so I loaded up Wonder Pony, donned my whites and did a quick demo for the 96 small people who brought their chairs outside for a quick lesson on our breed and a little Spanish for good measure. Thanks so much to The Classical Academy in Colorado Springs for being cool enough to welcome us. We had a blast. April is Autism Awareness Month. On the surface, that doesn’t have much to do with Peruvians or horses in general. But after reading a couple of books by Temple Grandin and watching the HBO movie about her life, I’m convinced otherwise. 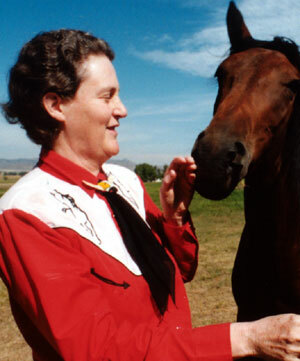 Grandin is a world-renowned animal behaviorist. In her books “Animals in Translation” and “Animals Make Us Human,” she goes into vivid detail about how animals see the world. 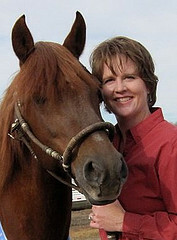 She covers cattle, poultry, dogs, cats, horses and even wild animals. With each species, she explains how her autism enables her to see the world as animals do — visually and with primary emotions of fear and curiosity. She explains that lighter-boned, hot-blooded horses tend to have stronger fear and curiosity than heavier, calmer horses. She uses Arabs as her example of hot-bloods, but I think everything she describes also fits Peruvians. For hot-bloods, punishment adds to the fear. Through positive reinforcement and calm, gentle treatment, we keep our horses curious. When they’re curious, they’re learning, communicating and focused on the task at hand; their brio is turned up. When they’re scared, they’re in flight mode. All they can think about is escaping the fear stimulus. I see this very clearly with Sican the Wonder Pony. As smart and malleable as he is, it doesn’t take much to push the fear button. And I’m sure there are plenty of Peruvian owners out there who’ve rescued their horses from people who just didn’t understand the damage they do through harsh treatment. The rehabilitation of an abused Peruvian is long and painstaking. For some, the trauma does permanent damage. So it’s up to us to better educate new people about the proper care and handling of our breed, and that means we have to better educate ourselves first. Do yourself and your horse a favor and pick up Grandin’s books. I hesitate to make a weather prediction here. We all know how quickly snow storms zero in on us after we make some seemingly benign remark about the glorious sunshine. And yesterday’s winds were brutal. In fact, they blew me right past the barn where I board my horse all the way up to Castle Rock to my friends’ indoor arena at Meadowbrooks Farms. We had a good time playing with a couple of his mares and his stallion. But today I’ll brave the winds and assuage my guilt with some quality time with my own cayuse, Sican the Wonder Pony. The aforementioned bad weather has contributed to his mildly tubby state. Now that the days are longer and the weather gods are kinder, we’ll be back in shape in no time.